Gini Wijnaldum branded it a game to learn from and a reality check in the overall context of the season, and while on the one hand the defeat in Naples could prove a welcome jolt ahead of Sunday’s visit of Manchester City, on the other, troubling questions have surfaced. Our friends at Football Whispers analyse the issues that have arisen and why Klopp has one major area of concern before taking on City. Losing at the Stadio San Paolo to a very good Napoli side is no disgrace, but it was the manner of the defeat that arouses the most concern, especially with City looming and the prospect of Liverpool’s title aspirations being radically addressed, should they lose. The Reds were one of the most vibrant and consistent attacking sides on the continent last season yet failed to muster a single shot on target – the first time in the Champions League since 2006 – and Mohamed Salah continues to look out of sorts. But as a collective, Salah, Roberto Firmino and Sadio Mane are too talented for that drought to be nothing more than a blip. With Naby Keita leaving the field, Liverpool’s midfield was once again exposed in Europe in its ability to dictate the flow of the game, the Reds were comfortably out-passed and never asserted any sense of control. However, scans have revealed the Guinean’s back injury to be minor so he should return for Sunday. The pressing issue before facing Pep Guardiola’s Premier League champions is in defence and not, for once, the central area where Joe Gomez has alongside Virgil van Dijk developed a strong understanding. If anything, somewhat bizarrely, Liverpool’s main source of strength at present is the two departments they were so inconsistent in last term: goalkeeper and central defence. It’s the men to the sides of van Dijk and Gomez who create the most concern pre-City, with Andrew Robertson and Trent Alexander-Arnold targeted relentlessly by Napoli’s attacking players. Of the ten opportunities created by Napoli, six were from wide areas. The left side of Mario Rui and Fabian Ruiz combined to create four chances between them, while on the right Jose Callejon fashioned two, including Lorenzo Insigne’s winger. In Robertson’s case, not only was he not quite as culpable as Alexander-Arnold, but since the start of the season it’s the first truly poor performance the Scotland international has produced so any anguish should be tempered. Alexander-Arnold, however, is in a slightly different place as it was his second worrying display inside a week having been tormented by Eden Hazard at Stamford Bridge last Saturday evening. There is no shame in that, of course, but with a rejuvenated Leroy Sane and Raheem Sterling on the horizon, there is real potential for more punishment. Firstly, it should always be accepted that at 19, the right-back will have off-nights and is constantly learning on the job having been a first-team player for barely a year. But Klopp has a duty of care in his development, and there is a strong case for not dropping the England international as such, but at least giving him a rest. 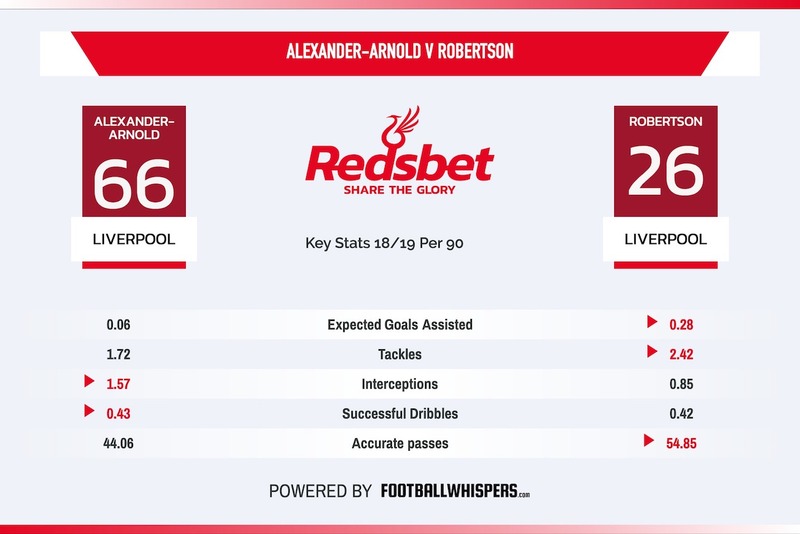 Alexander-Arnold has played 32 matches for club and country in 2018, a considerable volume for such a young player, and this season only Robertson has more minutes as an outfield player, and it’s a marginal difference: 810 to 808. When you factor in the intensity of playing Chelsea, Napoli and Manchester City in the space of eight days, it makes for a considerable challenge for a player of any level, let alone one so inexperienced. What is apparent is that, positionally, he’s not at the same level as he is with the ball at his feet and attacking on the front foot. Alexander-Arnold’s enthusiasm and desire to win possession back often sees him drift inside, leaving space over his shoulder and behind the defence. Against wingers of the calibre of Hazard, Sane and Sterling that is an extremely high-risk strategy, especially if there is an element of fatigue or loss of sharpness, whether it be mental, physical or both. City lead the Premier League for crosses per game (23), 41 per cent of their attacks originate down the left-hand side and they also top the rankings for average width of possession at 35.9m (Liverpool are second on 30.45). Guardiola is the master of creating overlaps and drawing defenders into areas they shouldn’t be and Benjamin Mendy’s mooted return could cause Alexander-Arnold an additional headache. In short: to have the best chance of beating the champions, your full-backs have to defend exceptionally well. It should be noted, however, that the teenager is a good tackler. He may just rank 33rd among Premier League full-backs with 1.72 per 90 minutes but his success rate is 70.8 per cent. His talent and attitude, of course, means he can put in an excellent performance and leave his difficult week behind. But, based on recent evidence, it looks an unnecessary risk for Klopp, especially as the manager has options including Nathaniel Clyne or shifting James Milner to full-back. As Wijnaldum said, lessons are there to be learned.